Is it cold where you are? This week has proven to me that I am out of practice when it comes to cold weather. I had to buy my first real pair of shoes in 4 years a few days ago. I have lived in flip flops and ballet slippers for so long that I forgot that shoes were a necessity. And jackets. And layers. This California (by way of NJ, SC, NC, NS, etc.) girl is not used to 37 degree weather any more. I am in for a rude awakening, or so I have been told by Kansas natives. I like snow, I have not seen real snow in years, but there is nothing more peaceful than waking up early to find a blanket of untouched white on the lawn. I love snow days. When we cuddle in our pjs, make hot chocolate, and watch movies all day and watch the snow fall. I look forward to this cozy weather. 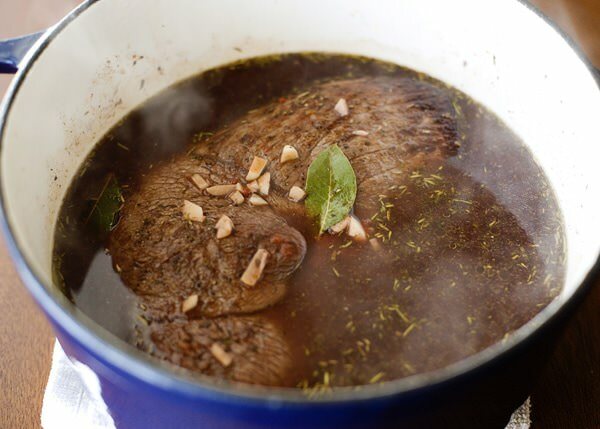 The most perfect thing that I can think of to make on a cold, snowy day is this wine marinated pot roast. It does take a long time to make, but with very minimal effort. A little light searing and chopping, and that is all of the real work. The magic happens in a long marinade and oven time. The wine soaks into the beef overnight, staining it a deep, red color. It immediately smells fruity when it hits the hot pan for a good browning. Simmer the reserved wine, and put the pot roast into the oven for a few hours. Throw in some vegetables towards the end and you are done. 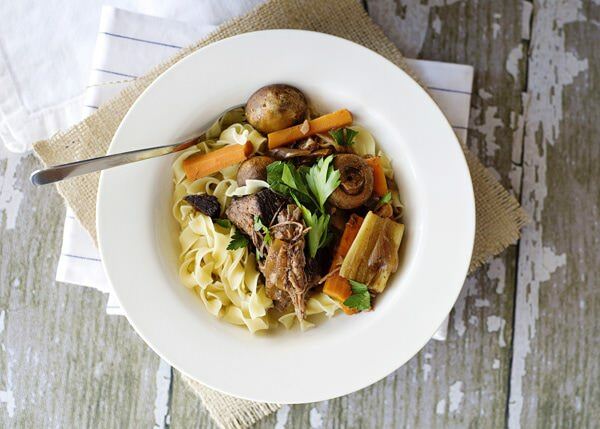 I like to serve my pot roast with buttered egg noodles seasoned with salt and pepper and loads of fresh parsley. I really think that something that has been cooked for as long as this pot roast has really needs a hit of freshness at the end. Trim any fat from the beef chuck. 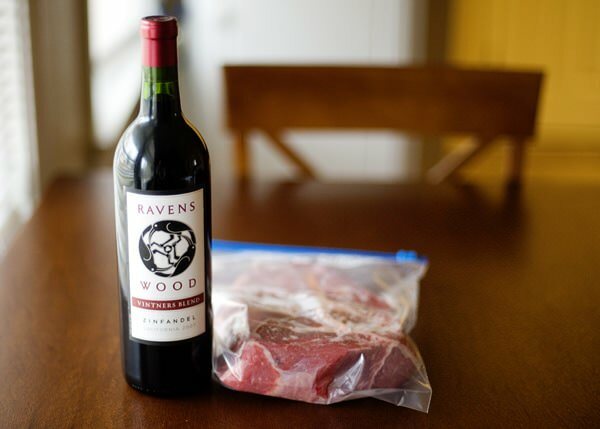 Put the beef in a large Ziploc bag and pour a bottle of red wine over the beef. Marinate overnight in the refrigerator. The next day, take the beef out of the bag, reserving the liquid. 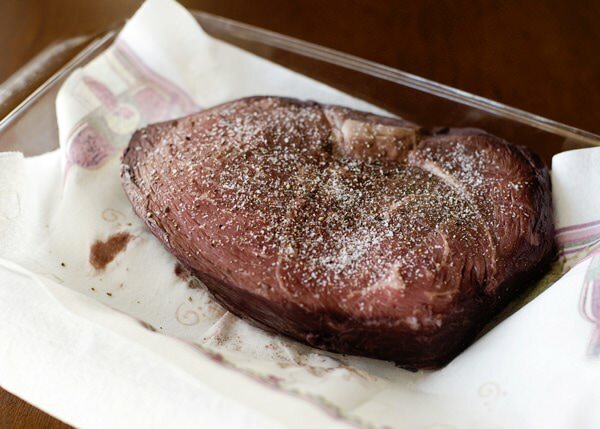 Dry the beef on paper towels and season well with salt and pepper. Preheat a Dutch oven over high heat. Add oil to the pan and brown the beef on both sides. Drain any fat. In a saucepan, bring the reserved wine to a boil. Reduce the heat, and simmer until the wine is reduced by half. It takes about 15 to 20 minutes. 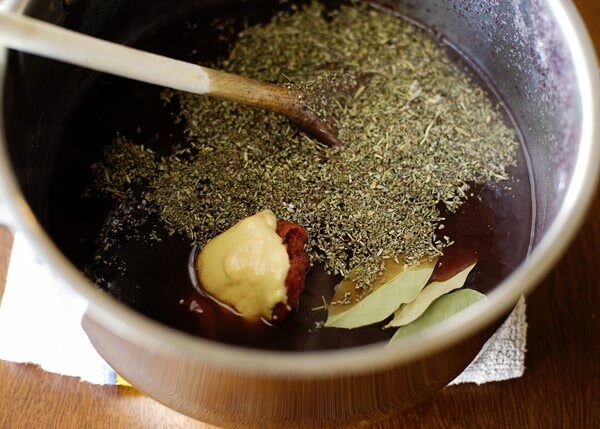 When the wine had reduced, add the beef consomme, tomato paste, herbes de Provence, Dijon, garlic, and bay leaves. Bring to a boil, and simmer again for another 5 minutes. Pour the wine mixture over the pot roast. Add the onions. Cover and put in a preheated 325 degree oven for 2 1/2 hours. 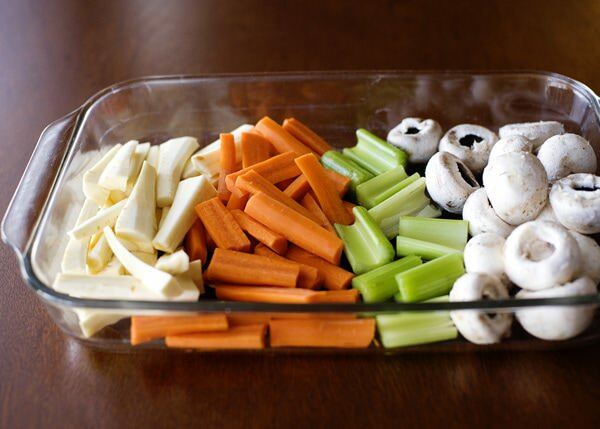 While the pot roast is cooking, prep your vegetables. After 2 1/2 hours, add the vegetables. Cover again, and cook for another hour. 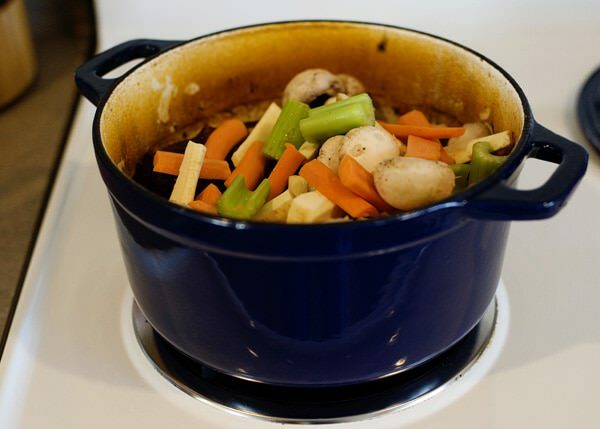 Check to make sure that the pot roast is tender and begins to fall apart. If it doesn’t put it back in the oven until it does. Serve with buttered egg noodles and garnish with lots of fresh parsley. This tastes even better the next day. Make sure you save some leftovers. 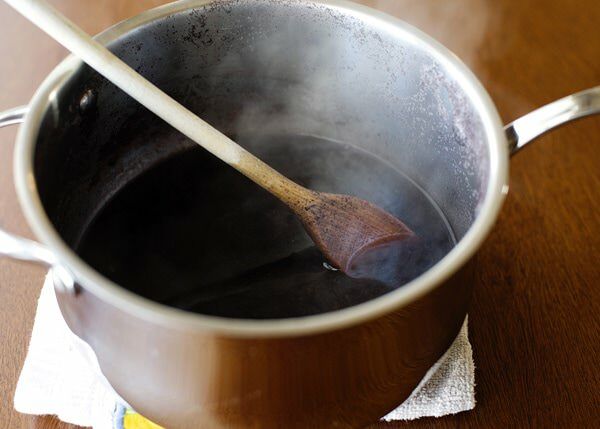 This recipe comes from Midwest Living Magazine, October 2011.
n a saucepan, bring the reserved wine to a boil. Reduce the heat, and simmer until the wine is reduced by half. It takes about 15 to 20 minutes. Looks great! I love pot roast AND red wine, lol. I need to give this a try next weekend for sure. 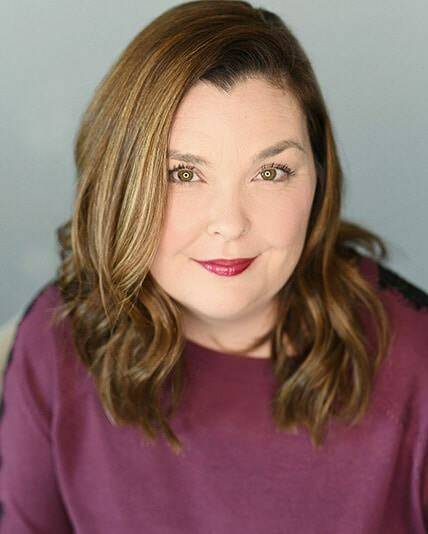 Thank you for the continuous inspiration! 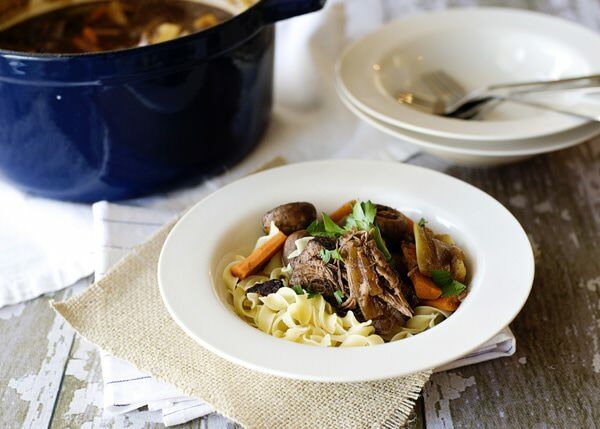 I have dome something very similar in the slow cooker… Nothing better than walking into the house at the end of a long, cold day to the wonderful scent of pot roast! YUM! Looks absolutely divine, Bree. Thanks! Gorgeous! I can’t think of anything that would be more comforting on cold day! Mmm, pot roast. That is the epidame of comfort food for me. I mean who doesn’t love big hunks of meat on a cold night? By the way, to answer your question, yes, it is very cold here. When I woke up this morning (5:15am) it was 5 degrees outside. The high today was 10 degrees. Tonight it’s supposed to go down to -2. Me too! One of my absolute favorite meals. Oh yum! This looks like some real comfort food cooking! This is Great for a tummy cramming. It’s healthy and looks yummy! Anything marinated is very much worth seconds! This looks hearty, satisfying and extremely delicious. 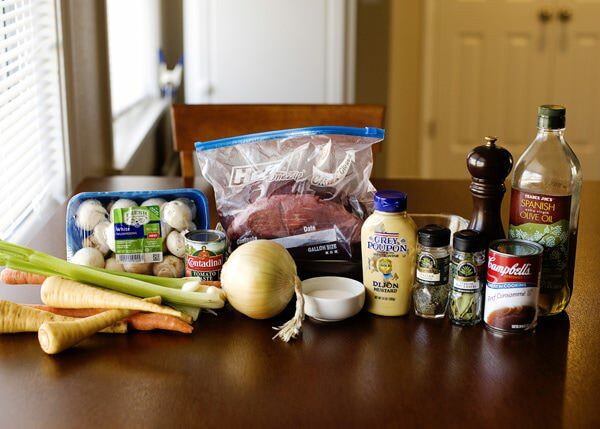 I’ve never done a pot roast before but I’ll be bookmarking this recipe! Thanks for sharing. this is my favorite version. LOVED this recipe. 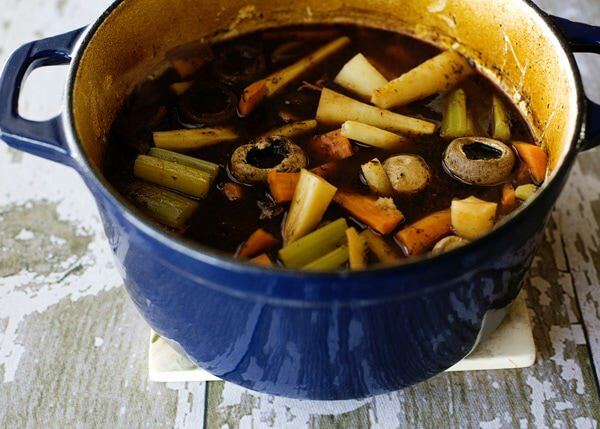 Thank you for sharing this pot of comfort! 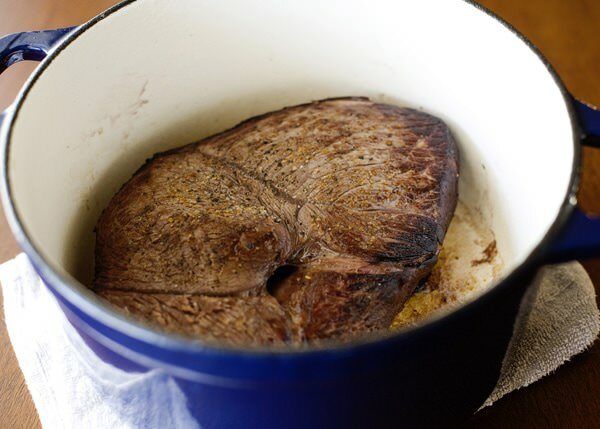 Do you think it would do well in a slow cooker after searing the meat? When would you add the vegetables? Yes, and another reader shared her method. I would add the veg the last two hours. This looks amazing! This is going on my menu for Sunday dinner this weekend. My husband will love this and this will be perfect for the cold winter weekend that is in store for us here in New York. 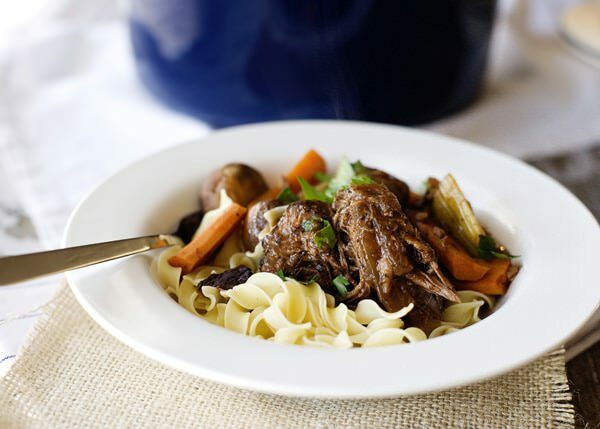 I also like to serve stews and pot roasts over buttered egg noodles, like when I made Julia Child’s Beef Burgundy. No idea why, it just seems right, like cooking the chuck in this recipe for hours. I love that your Dutch oven started nice and white on the inside, but ended up all brown… that’s how you know this is the real deal. Look’s great, Bree. DIVINE! Made for dinner last night. Adaptations for slow cooker: Cook meat, sauce and onions for about 3 hours on high; then add veg and cook for another 2 hours on high. PERFECTION! Sounds delicious…. might have to do a slow cooker version next time. Ever made Beef Bourguinon? Very similar.. and also delicious! Give it a go! yes, there is a recipe for it here. It is and I love Ravenswood. I’ve got this marinating in the fridge right now! (I’m finally coming back to your blog after being absent due to a oh-so-long bout of morning sickness. 🙂 Now I’m at that happy-happy-hungry stage of pregnancy and – oh look – I can even get some red wine back into my menu!) Thanks Bree! I have so been there. Only mine lasted throughout the entire 9 months! Looks like a great recipe! I want to try it soon but was wondering if you could recommend any side dishes to go with it? I saw you mentioned buttered egg noodles and parsley, but I was thinking more in the way of a vegetable? I’m a teenager cooking one dinner a week so I don’t have much experience with organizing meals and my Dad is always saying “Where’s the vegetable? !” so I thought if you had any ideas I could plan for that would help a lot. Thanks! The vegetables are inside. Carrots, mushrooms, parsnips. That is the beauty of a one-pot meal. If you had to add something else, I would make a simple salad. I am marinading the meat as I type. 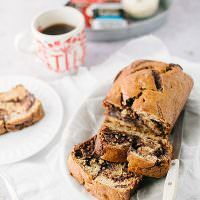 I had a recipe come up on my email and noticed this one when I went to the website and thougth, WOW, this sounds good. I love the pot roast that my mom makes with dr. pepper or coke (whichever flavor she has available). But I thought wine and pot roast, WOW. I never had parsnips before but I bought them to put in w/the meat and potatoes, too! Can’t wait to try it! I hope it turns out as good as it sounds! Your mom’s pot roast sounds good too. I love sweet and savory together. I guess I was somewhat disappointed or had other expectations with this recipe. I guess I was hoping that this would be more flavorful than past pot roasts that I have had. I felt other than it was super tender that there was not much flavor to it. I did add everything that was directed even the wine. The potatoes on the other hand was fabulous! WOW, they had tremendous flavor to them and I was very pleasantly surprised! I will make it again, though. I am sorry that you were disappointed. I think that this might also be a salt/pepper issue. A pot roast needs to be really well seasoned. Just to let you know….making this for small dinner party in Ecuador where we have difficulty getting all the right ingredients all the time. Some…improvising ….has occurred … but is smelling delicious so far!! Let you know how the guest enjoyed it!! That is the best way to cook! Hope that it was delicious.